The magnets should hold the diaphragm on when turned face down, ear cap off of course, and have a good stick to them. If they are weak you may be able to remagnetize them with a strong magnet without much disassembly needed. If this procedure doesn't give enough strength to the magnet, they you can get more magnetims by disassembling the unit and applying the booster magnet directly to the earphone magnet pieces. But it is worth a try as it only takes a few seconds. Remove the earcap and diaphragm. Use a compass to determine the polarity of the earphone magnet and then use your compass to confirm the polarity of your booster magnet. Next, touch that pole (South in this illustration) of the magnet to the corresponding (North) outside edge of the housing where the ends of the magnet are screwed down and tap lightly to set the magnetism. I tap the magnet on and off a couple times as the tapping "sets" the magnetism a bit. Repeat with the North end on the other side of the headphone. *If you want to get a little more strength, you can remove the flat magnets from the housing and touch tap the booster magnet right on to the end of the headphone magnet and the direct contact will give a little more strength. I use a big strong Neodymium Iron Boron rare earth magnet (not the ordinary bar magnet in the illustration) that gives a good result just by magnetizing the headphone magnet right through the housing. A smaller booster magnet might not give as good a result this way and may need to be applied directly to the disassembled headphone magnet pieces. 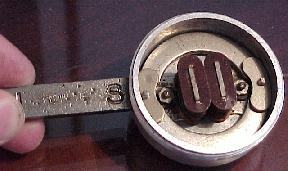 NOTE: The magnet pictured here is not the strong rare earth magnet described below. It is just a cheapie bar magnet with the N and S marked on it for illustrative purposes. The rare earth magnets are smaller. Repeat with the opposite pole of the magnet at the other edge of the housing. Now, try the diaphragm and see how the strength of the magnet is. Repeat if necessary. If you want to get a little more strength, you can remove the flat magnets from the housing and touch tap the booster magnet right on to the end of the headphone magnet and the direct contact will give a little more strength. A procedure has been described using electromagnets that are energized by huge capacitors that "flash" a brief but strong magnetic field by capacitive discharge through very heavy gauge wire coils around the magnet pieces. However, the method I described has worked very well and is quite satisfactory, much safer and requires no special equipment except the magnet and compass. The key is to have a very strong booster magnet like a rare earth Neodumium iron boron magnet. I got mine from www.wondermagnet.com but they are available at hardware stores for making magnetic latches, etc. They can also be salvaged from old computer drives. If earcaps are stuck tightly, try blowing a hair dryer on the cap for a couple of minutes and then unscrewing it. Use a rag or towel to protect your hand from the heat. I have had great success with thes. If still stuck, I have heard of a tool called a Boa Constrictor by Harbor Freight that has a rubber strap and a lever to grasp the unit for some extra leverage. Sears also makes a strap wrench in their Crafstman line of tools. The ends of the cord are exposed to constant bending back and forth and the pin tips frequently break off. To reset the pin tip it must first be emptied of the old wire soldered into it. It is best to hold it in a clamp like a hemostat clamp, that can be obtained at a fishing store, craft or tool shop, or a clothespin. Otherwise you can drill a little hole in a piece of wood for the narrow tip to fit into and leave the wider part of the tip sticking up. 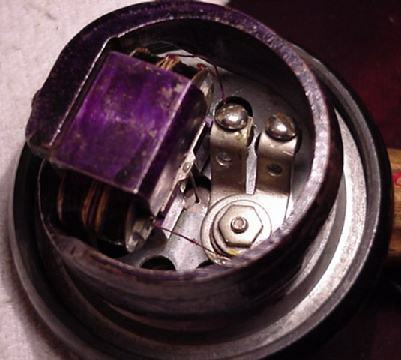 Heat up the tip plug with a good hot soldering iron and pull out the debris. A little 30 watt iron won’t do the job. Use a big 100 watt or bigger soldering gun that gets nice and hot or you will wait forever for the tip to reach solder melting point. While the solder is still molten turn it over and bang out all the remaining debris into the trash can watching out for the hot solder. Trim the insulation about 1/8 back off the tip of the wire, so the copper conducting strands are protruding like in the white wire above. 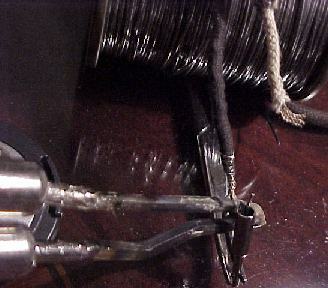 Then use a fine single strand of about 28 gauge bare or tinned wire and start wrapping the tip of the wire, start wrapping about 1/8 from the end of the insulation and wrap tightly all the way to the tip of the conducting strands like in the black wire above. Cut off excess wrapping wire. The cord is then prepared to attach to the tip. Holding the pin tip in the clamp, heat it up and melt some solder inside. Then push the wrapped end of the cord into the tip and try to get all of the wrapped part into the tip so you have a neat joint. Let it cool and test it with a gentle tug to make sure it holds firmly. Take this hot link to a related page by a colleague who specialized in sound powered equipment. 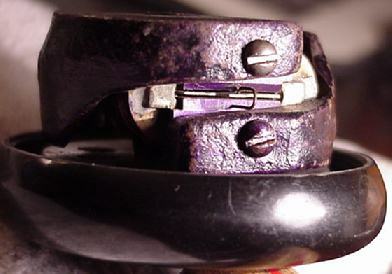 Baldwin headphones are very difficult to repair since they have a moving armature that pivots at the center and has a very narrow slot that it fits in between the magnet and coil cores. The diaphragms also were subject to damage. A small crack in the mica may be inconsequential or could be sealed up with some super glue or Duco household cement. If the mica is completely shattered the sound will be poor and the diaphragm should be replaced if possible. In the picture you can see the end of the thin armature plate that has a little bent over pin to hold it in place. There is a tiny clearance on each side of the armature so it doesn't touch the magnet poles or that would stop the free vibration. The space should also be free of any debris that would dampen out the movement. Inside, you can see the attachment of the armature to a pin and from there to the center of the diaphragm. The connection of the pin to the diaphragm is difficult to detach and replace so that it works properly. The trick is to get the armature positioned exactly in the middle of the air gap with the diaphragm pulling one way a little and the positioner pin pulling the other way, without too much tension on either. 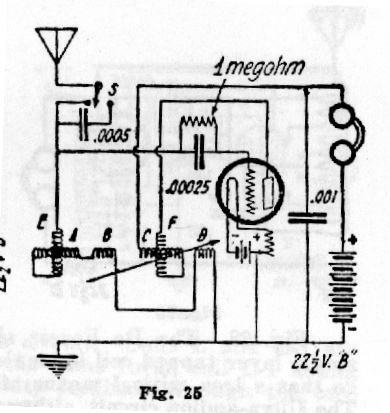 Military sound powered headphones work on a similar principle, but most have the armature secured a one end and the pin to the diaphragm is at the free end. If you are lucky, the pjin is threaded and there are tiny nuts that hold the diaphragm in position. 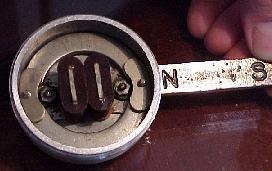 To adjust the position of the reed, you screw the little nuts up or down the shaft to get the reed in the right place. This takes some fine tools and I use some surgical hemostats to reach in there and turn the nuts. Play Things of Past, click or phone 216 251-3714, $30 minimum order. Now with a website.